Axes have been around for almost as long as people have. One of the first simple tools, the axe was originally created by combining a wooden handle with a sharpened stone blade. Today’s axes have steel heads and many have fiberglass handles. There are several different types of axes, depending on the job. 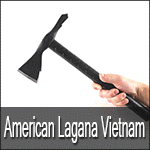 A tactical axe is used for self defense and breaching, or gaining access to closed spaces. A camping axe should not only be able to split wood but also serve as a multi-purpose tool at the campsite. A survival axe is one of the most important tools you can purchase, and it’s worth investing in a quality tool when it comes to a life or death situation. Throwing axes, usually tomahawks, are multi-purpose tools that are versatile and have an expanded range since they are made for throwing. Many people will tell you that a high quality wood splitting axe is worth its weight in gold because it not only does a better job but also makes the work of splitting logs much easier. Here at Axeing.org we review a wide range of different axes. 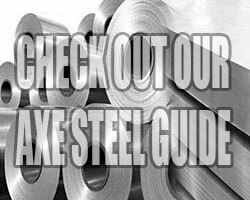 We provide news, axe reviews, axe education and best of all we’re not a axe vendor so you can be sure to get impartial advice. And below we have narrowed our recommendations down to five axes best suited for the five major needs outlined above. Depending on whether you’re looking to buy an axe for tactical use, camping, survival, throwing or wood splitting, these are all great axes that won’t disappoint you. 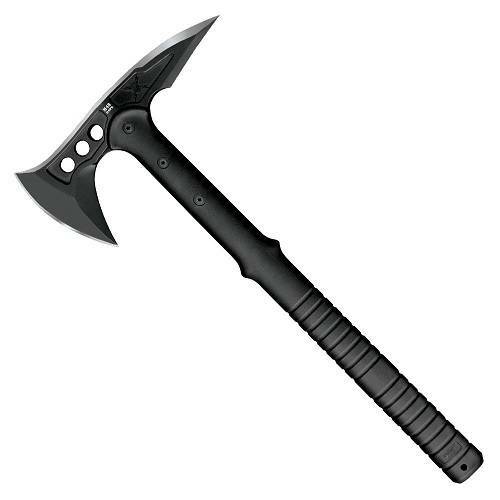 The Tomahawk is the best kind of axe for tactical maneuvers like self-defense. It also makes a decent battering ram or pry bar when used as a breaching tool. 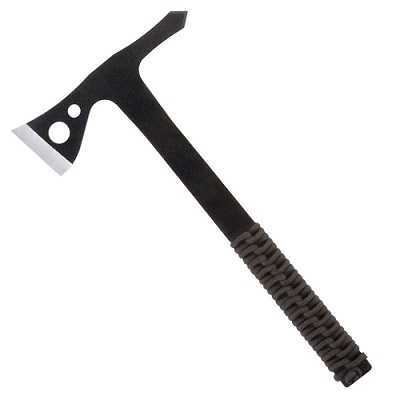 The M48 Hawk Tactical Tomahawk is lightweight at just under two pounds, making it easy to swing for sustained periods. It has a wide blade for chopping, slashing and cutting. It’s also fairly inexpensive at less than forty dollars. The nylon handle of the M48 has ridges for a secure grip and the blade is made of anodized steel. The cutting edge is very sharp and the pointed end, while not as sharp, is good for puncturing softer material. The axe is 15 inches long with an 8 inch axe blade. 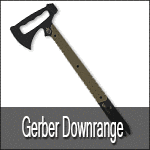 Overall, this is a lightweight defensive tool suitable for moderate use. It comes with a nylon sheath and the only complaint about the M48 is that it doesn’t come out of the sheath as quickly and smoothly as it could. While the M48 Hawk Axe is a reliable tactical axe, it is also good for clearing brush and chopping wood. It makes an excellent backup weapon when hunting wild game. In a close situation that limits the effectiveness of a rifle or shotgun, the M48 makes a better self-defense weapon. Many users say that it has a good balance and others like the design, a smooth black blade with a skull engraved on the pointed side. There are a few basic tools that you need when camping in the rough and a good hand axe is at the top of the list. For camping, a full sized axe would be hard to lug around and probably more axe than you really need. The hand axe does virtually the same job as the regular sized axe but the handle is 2/3 as long. A camping axe should feel balanced in your hand, with the shaft and head weighing about the same. 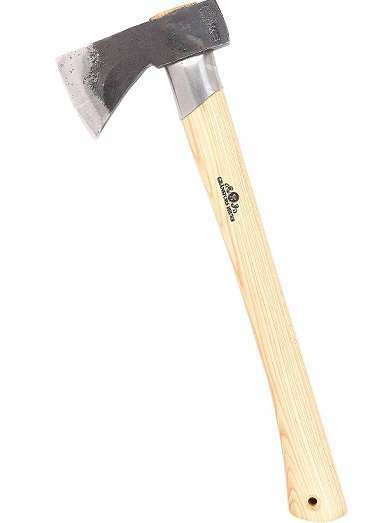 For camping, we recommend the Estwing E44A 16-Inch Steel Camper’s Axe. A single bit axe, the flattened side of the blade is useful for driving tent stakes into the ground. It’s tough enough to fell trees, split firewood and notch timbers. At 16 inches long with a 4 inch cutting edge, it’s easy to wield. The handle is wrapped with a nylon shock-resistant grip. The Estwing E44A is a rugged axe that can handle just about anything that comes up when camping. At less than three pounds, it can conceivably be used with one hand. It also handles well enough to use for de-barking wood before chopping it. The head and handle are one solid piece, making it more unlikely to break. The axe comes with a leather sheath to protect the blade and is reasonably priced at less than forty dollars. Keep in mind that a survival axe has to do several jobs and do them well enough for you to get by for a period of time without any other major tools. The longer the handle, the more force the axe will have, so a longer handle makes chopping and hacking easier. The best survival axe size is one that is at the limit of your ability to swing for an extended period of time. Whether it’s used for cutting wood, breaking ice or defending yourself, a survival axe can save your life. The flattened side of a single bit axe is good for pounding nails and breaking ice. If your matches get wet or you lose your flint striker, using sparks from rocks struck against the sharpened axe blade is a backup method for starting a fire. If you break a bone, you’re going to need a splint and a pocket knife won’t help. We chose Gransfors Bruks Outdoor Axe as the best survival axe in part because it’s light enough to be portable and it has a metal reinforced collar. At just over a pound, it’s also at a good weight for one handed swings. This axe is effective for making sharpened points on branches and splitting wood. It is definitely up to the job of building a temporary shelter. The handle is made of hickory and the axe comes with a protective leather sheath. The blade of the Gransfors Bruks is elongated and tapered to do an excellent job of splitting wood and the reinforced collar is at the area below the blade that gets the most abuse. The axe does a good job when making kindling for a fire and it’s light enough to be carried as a belt axe. This survival axe was developed with the input of well known survivalist Lars Fält. It’s not cheap at around $175, but in a survival situation you want the best, not the least expensive. The 14.5 inch handle is long enough to give the 4 inch axe blade enough power for cutting down limbs. This is an excellent tool for hacking, chopping and even felling trees. Because of the portability and versatility, it’s the best choice from the Gransfors Bruks premium line of tools to use as your survival axe. The average tomahawk is 14 to 21 inches long and the length can affect the speed and accuracy of the throw. The Algonquian Indians in North America were the first tomahawk users, using stone heads attached to wooden handles with strips of rawhide. They used the tool for chopping, cutting, hunting and as a means of self defense. 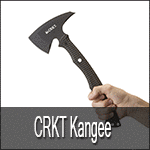 The tomahawk is an effective tool to use in close quarters like hand-to-hand fighting. In recreational tomahawk throwing, the tomahawk is thrown at a stationary wooden target. The tomahawk should be gripped as you would a hammer and an open-legged stance is needed for stability when throwing. It takes practice to determine just the right distance to stand from the target to make the tomahawk stick in the wood. Not all tomahawks are equal when it comes to the ability to withstand regular throwing without coming apart. 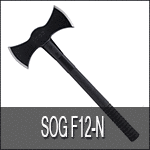 SOG tomahawks are protected by a hardcased black coating and they are very scratch resistant. Each one is forged from one piece of stainless steel with braided nylon paracord wrapped handles. 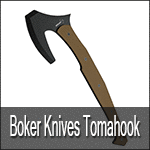 The TH1001-CP Throwing Tomahawks weigh 1.6 pounds each and they are sold in packs of three for around forty dollars. All three blades come with nylon storage sheaths and edge guards for the blades. The handle on this axe is 10.75 inches and the blade is 1.75 inches. The three hawks in the set double as backup tools, useful for prying, light chopping and piercing. Also, the paracord wrap can be undone to be used in an emergency. Be sure and note that the blade is not suitable for bricks or concrete and will chip if you try to use it on those materials. The blade edge is very sharp and the spike side is honed to a point, so good knife handling practices are important when using the TH1001-CP tomahawk. It is a well-balanced throwing tool and it’s light enough to keep throwing for sustained periods. For firewood, you’ll need an axe that’s a good splitter. Logs need to be split into smaller pieces in order burn well. 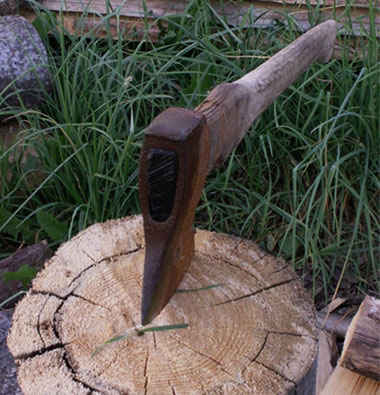 A splitting axe head is designed to separate the fibers of the wood rather than cutting them. You’ll also need a good balance of weight to power for an effective axe that won’t cause fatigue after a few swings. The 36 inch Fiskars X27 Super Splitting Axe has a fiberglass handle that is lightweight and capable of absorbing the shock of impact. The handle is molded over the blade to keep the two pieces from separating. This axe will split medium sized and large logs and the hardened forged steel blades stay sharp for a long time. The 36 inch handle length balances the heavily weighted 3 inch blade, creating the force needed to split wood with less effort than a maul. Users report splitting wood with one strike and having no problems with the axe getting stuck in a log. When the six pound axe is sharp, it makes swift, powerful cuts with minimal effort. Fiskars brand is made in Finland and the X27 lives up to the Fiskars reputation for quality craftsmanship. The axes are made with a proprietary grinding technique for a sharper edge that lasts longer. The blades on this axe have a low friction coating that keeps the blade from getting stuck. At around fifty-five dollars, the Fiskars X27 is without a doubt the best value we have found in a splitting axe. Difference between an axe and a hatchet? So what’s the difference between an axe and a hatchet? Well, the size, composition and use of these two tools differentiate them from each other. An axe head tapers only slightly toward the cutting edge, whereas the smaller hatchet head is more compact, with a wider cutting surface. A hatchet is portable and more lightweight overall, making it suitable for lighter jobs such as cutting small limbs or bushes. An axe is a sturdier tool, used for chopping and splitting wood, cutting up game, breaking heavy ice, chopping turf, and more. Polished steel axe heads reduce the friction between the blade and the wood when cutting logs. Axe heads come in different shapes and sizes and may be sharpened on one or both sides. Regardless of the type of axe, it’s important to wear sturdy work gloves with gripping power when using one. When splitting wood, goggles are another recommended safety measure to protect your eyes from stray wood shards. A single bit axe has one side sharpened and a double bit axe has both sides of the head sharpened. Sometimes a double bit axe is purchased to allow more time before the axe needs to be sharpened. Some people like the balance better and the double bit axe can be useful if one side is used for heavier cutting and the other side reserved for fine chopping.